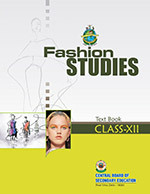 Fashion Studies Textbook is for Class 12 Students. This Book is issued officially by CBSE. This Book Contains the following chapters. You can download the complete book in a single zip file (containing all chapters in pdf format) from the link.